Feeling rather bored of your normal cup of morning coffee? If you’re ready to shake it up and try something different, the Moustache Coffee Club is a coffee of the month club that will do just that. Instead of drinking the same old coffee, you’ll be able to sample java from around the world. There are coffees from Guatemala, Ethiopia, and El Salvador. The flavors you’ll experience will range from plum, chocolate, and caramel to berry, grape, and even tobacco, Yes, you read that right! What’s more is you’ll never have to venture to the grocery store to pick up a bag of coffee beans again. 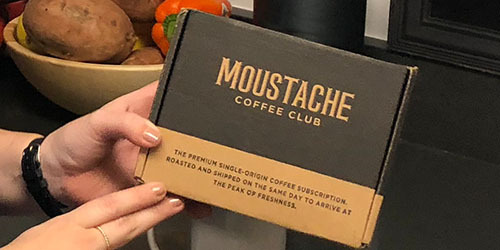 Moustache Coffee Club gets shipped straight to your door. If you’re like me and you’re addicted to coffee, it’s a dream come true. 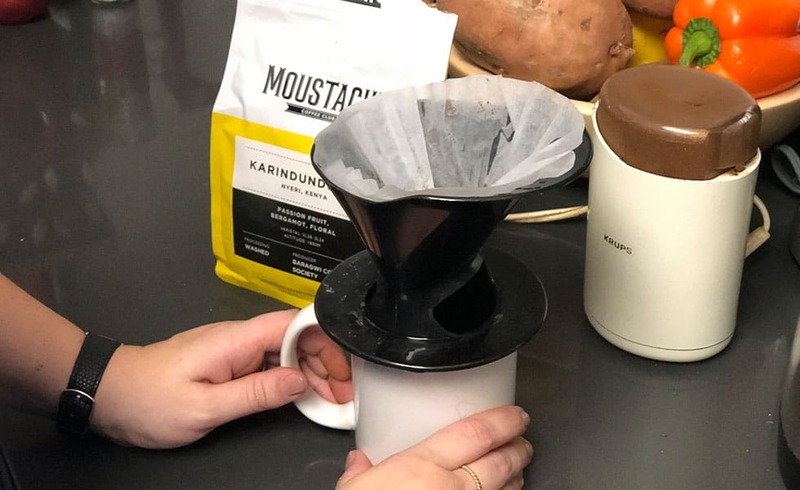 Let’s check out everything you need to know about joining Moustache Coffee Club, their selection of coffee beans, and most importantly… How it tastes! Signing up for their service is relatively easy. The first thing you’ll need to do is visit the Moustache Coffee Club’s subscription page. It has all the details you need to know about their service. Plus, it’ll prompt you to make a few choices based on your coffee drinking needs. Next, you’ll need to decide how much coffee you’d like to receive. You can choose between a 12-ounce bag or a smaller, six-ounce bag. From there, you will choose your delivery frequency. You can receive coffee club deliveries every week, every two weeks, or every month. If you want to, you can further refine what type of coffee gets delivered to you in your account. So far they have the option to choose whether you receive their classic profile coffees and their decaf coffee. Since there are only a limited amount of each coffee type, you’ll want to make your selections early. The Moustache Coffee Club will let you know what they have available at the time. And once you’ve received and tasted yours, you can rate it afterwards. This helps them to make better coffee selections based on your preferences going forward. If you’re not 100% ready to sign-up for their service, you can try their coffee for free first. They’ll ship you a six-ounce bag of coffee for you to sample. Then, you can decide whether it’s right for you or not. The types of coffee you’ll find on their roast schedule will vary. This gives you the most amount of variety each delivery. Moustache Coffee Club likes to use single-origin, in-season beans to ensure you’re getting the best quality in every cup. That means they won’t always have the same coffees available to you. Los Angeles Decaf from Huehuetenango, Guatemala: with tasting notes of chocolate, cherry, and sage. You’re able to reserve coffees up to one month in advance so you can secure your favorites. If you find something you absolutely love and want to purchase again, let the Moustache Coffee Club team know so you can purchase it again if it’s still in their inventory. It won’t always be available, but it’s worth reaching out if there’s something you’re just dying to have again. Those of you in the United States will be pleased to know you can order from the Moustache Coffee Club without any problems. And yes, that means those of you in Alaska as well! You can expect your delivery to arrive via the USPS. You’ll be provided with tracking information so you can always stay updated with where your order is at and when it’ll arrive. However, you should expect to receive it within three days because everyone loves a speedy delivery. You are also not required to be home to accept delivery of your order. Your local postal carrier will leave the package at your house as long as they deem it safe to do so. So, if you’re away at work, your coffee will be there waiting when you arrive home. The good news is, nothing needs to be kept cold in your order. That means you don’t have to deal with excess packaging such as insulated liners, ice packs, or dry ice. Your freshly roasted coffee beans will arrive in a small cardboard box and be packed inside a resealable pouch for convenience. We found that the resealable pouch keeps the beans surprisingly fresh over the few weeks that we used the beans. When it comes to your morning cup of java, you obviously want it to be fresh and flavorful! There’s no better way to ruin a morning than with old coffee beans that have been sitting on a shelf for ages. Luckily, you won’t have that problem when you join the Moustache Coffee Club. Because their team tastes thousands of coffees throughout the year to find the best beans possible. Not only that, but they’re a company that isn’t interested in blends. Instead, they stick to single-origin coffees and use in-season beans for the best taste. Single-Origin: This type of coffee, as the name suggests, if from one place. Because of this, it is going to have a unique flavor when compared to other coffees. Single-origin coffee allows you to taste the specific flavors and characteristics of the coffee and where it’s been grown. Blends: Again, as the name suggests, blends are a blend of different coffee beans. Roasters create blends as a way of diversifying flavors while also creating a coffee that’s consistent. There’s no “surprises” when you’re drinking a blended roast. 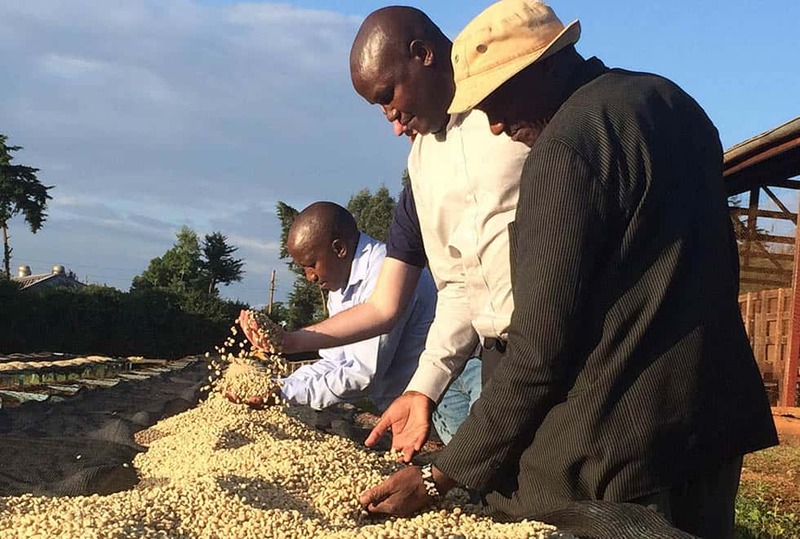 We had the opportunity to review the Karindundu 256 coffee from Nyeri, Kenya. The name “Karindundu” actually has some pretty interesting/dark origins. It was given its name from the Kikuyu word meaning ‘the wrapped’ because of a man who was killed and wrapped in bags during the Kikuyu and Ukabi wars for being a traitor. The area in which the coffee is grown has volcanic soil, which tends to lead to a more aromatic and complex taste. After the “cherries” are picked and hand sorted, they are then skinned and pulped for fermentation. The fermentation process lasts 16-24 hours under shade. Lastly, they are washed, soaked, and sun dried up to 21 days. The flavors within the Karindundu 256 coffee were definitely unique. Because of how and where it was grown, the coffee had notes of bergamot as well as a light fruity taste. The bag said that it was supposed to also have specific tasting notes of passion fruit, although we couldn’t exactly taste it. Overall, the taste had a brighter and pleasant taste. It certainly wasn’t like the deeper, darker roasts that I’m accustomed to drinking. However, that’s exactly what I enjoyed most about it — the uniqueness of the flavor. The cost of your subscription really depends on how much coffee you’d like to receive. A six-ounce bag will cost you $13 for each delivery, while the 12-ounce bag costs $22. And as mentioned, you can choose between weekly, bi-weekly, and monthly deliveries to satisfy all your coffee needs. You don’t have to worry about paying shipping, which is a nice bonus! If you want to cancel your subscription at any time, all you have to do is get in contact with the Moustache Coffee Club and they’ll deactivate it for you. You’ll never be locked into a long-term subscription so you can leave whenever you feel is the right time to say “goodbye”. For any coffee lovers who are looking to expand their horizons, Moustache Coffee Club is a great option to consider. You can feel confident when you brew your next cup of Joe knowing you’re getting high-quality, single-origin coffee beans with each order. Not only that, but instead of drinking those coffee pods you’re used to, you’re getting the opportunity to taste coffees from around the world. The funnest part of their service is the variety of coffees and that each delivery is a flavor surprise. To be honest, I can’t see anyone getting board with this coffee club. Beyond the fact that they offer free shipping as well as a free sample for first-timers, they also have a Starbucks gift card buy-back program. If you have any unused/unwanted Starbucks gift cards, Moustache Coffee Club will buy them back from you and credit you account the amount that they’re worth. Overall, this coffee club is fun, unique, and offers a ton of single-origin variety. What more can a coffee lover ask for?